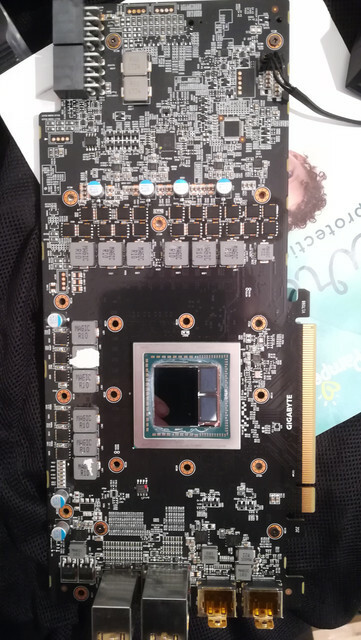 Users experience of Gigabyte Vega GPUs??? Discussion in 'Graphics Cards' started by ANDREW GREEN, Feb 11, 2019. I wondered if this was a bad idea and what users experiences of this model has been. IE is it fixable or will it just be a completely negative buggy experience. I wouldn't touch Gigabyte AMD GPU, especially Vega as they have done pretty poor job with sub par coolers especially. Saying that, if you were asking about the (Gigabyte) Aorus GTX1080Ti Xtreme, I would have said buy it without second thought, as I had that card and was amazing beast with supreme cooler. I must of been lucky my v56 it was a brilliant card, never had any problems with it. Reviews do give it a bad impression. Criticism seems to be over the heatsink design, however in my opinion it's actually more than capable, certainly than the broken batch of asus strix. Temps were good at 60-70c max after a long gaming session. Easily undervolted to 1.05v for 1600/900. Hbm overclock was a little poo though. It's always best to go for a brand that only makes AMD cards as they obviously put all their R&D budget into developing coolers for AMD gpu's, In the past big companies that sell both AMD & Nvidia gpu's like Asus, Gigabyte & MSI have been known to save money on AMD R&D by cutting corners & using heatsinks that were originally designed for their Nvidia gpu's, I'm not saying their gpu's are all bad, just that you are taking a risk, I've been caught out like this twice, once with MSI (290x) & more recently with a Gigabyte (RX 560). Is this your's pulled apart? Why did you do that? Presumably you did a paste change, pads too? Did it make a difference? Is is your's pulled apart? Why did you do that? Presumably you did a paste change, pads too? Did it make a difference? Hey mate, yeah was my v56 that I pulled apart before selling. It was fully functional with no problems, I replaced the die Tim with some Grizzly, purely to give the card a freshen up, (dedust and clean) before selling on. I didn't replace the pads, but the pad piece that is missing was on the inductor anyway. Here's a short clip of it after I did it. I'd say maybe there was a 5c difference after applying it. That's a decent temp drop. Gigabyte aren't good cards in general tbh. The Gigabyte geforce I had was shocking quality.